Beginning in 1961, Youth Art Month is a time, usually in March, dedicated to highlighting, showcasing, and promoting youth art and art education. On the national level, students design a flag that represents their state based on a given theme. The chosen designs are then honored at a flag ceremony in Washington, D.C. In addition, each state presents Youth Art Month events. The South Carolina Art Education Association celebrates this month through a variety of ways, including public exhibits and receptions honoring student artists. 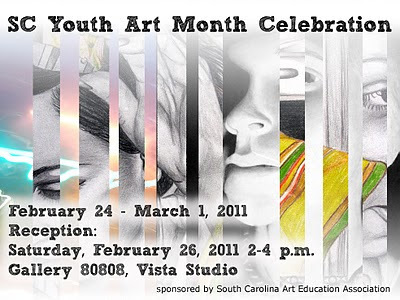 Each of South Carolina’s four regions has developed its own Youth Art Month traditions. Promotes and advocates for the arts. Provides students with an outlet to be creative. Celebrates individualism but honors and respects other’s views. Gives students the opportunity to use a variety of materials to problem-solve. Helps students to build connections to other curriculum areas and the world around them. Allows students to examine, interpret, discuss and analyze artworks in relation to history and world culture.